MobBob is a smart phone controlled, 3D-printed robot that I designed and have been working on. 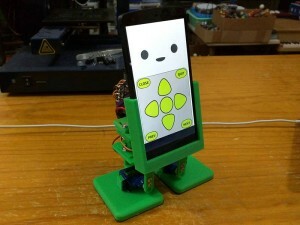 He was inspired by the popular, 3D printable BoB the Biped robot. The phone communicates with MobBob’s body using Bluetooth. 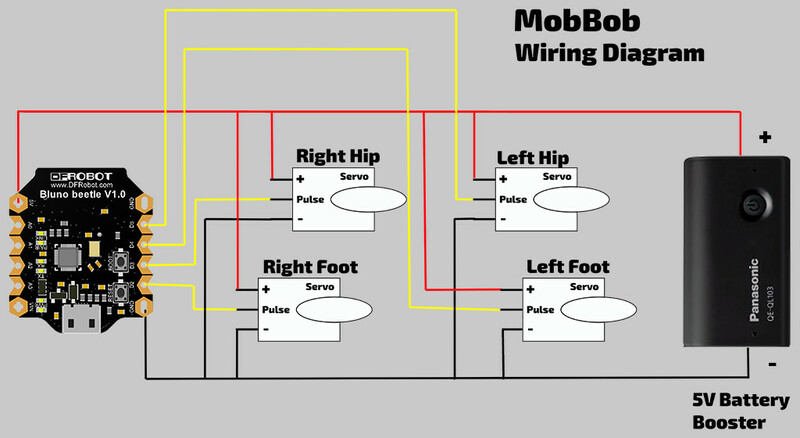 A few people have been asking how to wire up MobBob! Here’s a diagram using the Bluno Beetle, and the Battery Booster that I use. You can use other Bluno boards like the Bluno Nano. You can also use other 5V Battery Boosters. Congratulations yor this great project especially for sharing such a wonderful app! I love the voice recognition feature and would love to tinker with it on some arduino projects. Can you tell me if the app will work with some other bluetooth modules like HM-10?? or is it tied only to DFrobot bluno series. HM-10 uses similar chip as blunos so it seem that it should be compatible. what software you used to make the application? I used the Unity game engine to make my app. I haven’t tried, but I think the app won’t currently work with cards like an HM-10. However, I want to make other bluetooth boards a more traditional connection with pairing, etc. I’ve had a few people ask about this, so I want to add support for other bluetooth boards! I’ll have a look at it this weekend… So hopefully, I’ll have an update soon! I don`t mind to bother you as it is your hobby project. But if HM-10 is also a BLE-Serial module (as I suppose Bluno works) then wouldn`t it be only a matter of adding its characteristic ID to your list of devices to achieve compatibility?? What you said makes a lot of sense and I think it might work! I don’t have an HM-10, so I can’t test it out. However, I just put in a code change to try to support the HM-10. I’m not sure if it’ll work… but I’ve added a new button to the app that will try to connect to an HM-10 using the above UUIDs. I’m just putting the app into Google Play now, so it should appear in a few hours. If you try it out, please let me know if it works! I can’t test it myself! I got the HM-10 module today and installed your update. I have never used this module before and I only have experience with HC-05/06 bluetooth 2.0 modules so I need a while to make it work. Thanks for the update. That sounds promising. Did the app get into the part with MobBob’s face? If it did, then it sounds like the app was able to find and connect to the service and characteristic. Hopefully, the “pass through” service on the HM-10 is the same as the one on the Bluno. Fingers crossed! Please let me know how you go! If there are tweaks needed for the HM-10, I can try to put those in. Had no problems with connection between the app and bluetooth modul. I am working on a robotic project called LO FI ROBOT (www.lofirobot.com), it is an open source robotic kit with lasercut plywood blocks (inspired by Multiplo), Arduino and universal electronic components. Would you mind if i wrote some tutuorials describing how to use your app with some other robotic constructions?? I’m happy for you to write about the app in some tutorials. Please let me know what you post. I would love to check it out (even if I can’t read Polish). [WL, #, #] – “WheeL” with one parameter for each wheel. -127 to go full speed backwards up to 127 for full speed forward. Your LO FI ROBOT project looks great. Some of the designs on the website look very cool! Please keep me up to date with it. I have some experience with Multiplo. I made a 4-servo biped with it! (https://www.youtube.com/watch?v=wZdCfz4gq1U) I was only just starting to learn how to use an Arduino back then, so the code was much more basic back then. Built one! Used an Arduino Uno and HC-06 Bluetooth module. It’s covered in breadboard wires. More comments to follow soon, just wanted to thank you for putting these instructions up! These errors keep on going down the page and sadly, due to my complete ignorance with code, they mean absolutely nothing to me. I have tried mucking around with different values, but since I don’t know what I’m doing, it’s not having much of an effect. I have read your read me, and your comments through the code, but nothing I can find indicates that I have missed something. I understand that my description of the problem is a little vague, but if there’s an obvious direction that you could point me in, I’d be really grateful. Help me cevinius. You are my only hope. Thanks again for the awesome project! Thanks for the kinds words. Hopefully, you’ll get him up and running soon. First, is the file definitely complete? As a double check use the “Download Zip” button on the right hand side of here: https://github.com/cevinius/MobBob and check try the file you get from there. Also, in Arduino’s Tools>Board menu, please confirm it’s pointed to Uno (which is what you use for the Bluno). We’ll figure this out. 🙂 Let me know know when you have more info. It looks like they are now stricter in 1.6.6 with wanting forward declarations…! What worked in 1.6.4 no longer works in 1.6.6! I did a quick update of the code to address this and pushed it up to Github. Please try again with the latest version. Well, whatever you did to the code, it worked! So a very big thank you is in order for your super fast work! The code now gets through the compiling stage (where it was getting stuck), and successfully makes its way onto the board. I can tweak the servo centers, and it works as you intended. As with all of these things, resolving one issue tends to reveal another, and so it is with mine. I’m a bit of a luddite cheapskate when it comes to phones, and I’m still happily using my Samsung Galaxy S3 4g, which I’m now thinking is verging on a bit long in the tooth for a project like this. It passes the BLE test using the ‘BLE checker’ app (from google Play), so I had hoped that it would connect, but I’ve had no luck so far. I’m entertaining the idea that I may now have to get another, more modern, device to use for this little bot. I also don’t know anybody with an Android device newer that mine, so I’m a bit stuck with testing. If, off the top of your head, you know of a BLE compatible budget phone (Aus local), be it new or second hand, then I’d happily take the advice. On a brighter note, I’m really looking forward to seeing this MobBot work, as I have completely redesigned the chassis, including making the phone cradle universal, enclosing the Bluno and wiring, as well as making it more durable, for times when little mobby finds itself in the hands of youngsters, though the balance and weight distribution need to be tested before I can share the files. Thank you again for your speedy reply and assistance on such a fun and inventive project. That’s great news that the Arduino part is sorted. I’m not sure about other phones. I’ve tested on Nexus 5, 6 and an S6. I don’t feel confident to suggest anything else since I haven’t tested… but I would guess a recent model bottom of the range phone should work. All the best with these last few steps! Sounds like you are pretty close to having him walking around. The phone (Samsung Galaxy S3 4G GT-I9305) is running Android 4.3, and as far as I know, it has the latest updates available to it. And I think that you are correct about the phone initially only having the bluetooth 4.0 hardware built in, with the Android / Samsung support to follow. Having tested it, and getting the green light from ‘BLE Checker’, I thought that I might be in luck. I guess that I’ll have to do some internet research, and try to find a compatible cheapie! I’ll be sure to update you with whatever I discover. Sounds like you have the latest. You have probably already tried this, but one final suggestion is to try connecting with the “Scan Only for Device Service” checkbox ticked and then with it not ticked. To be doubly safe, after an attempt, kill and restart the app to make sure there’s no weird bluetooth stuff lingering. I am developing a robot based off of the poppy robot chassis. I am not using the expensive dynamixel motors and am beating my head against the wall trying to learn programing. Sort of cart before the horse issues mostly. I’m switching gears and going to build a simpler biped to learn more. I like the autonomous aspects of your robot and the voice recognition, vision from camera and usage of smartphone sensors etc in your app. Granted this is an as I learn more question can the app be modified to add more leg servos and arms gripper? Is that all in the arduino code or the android app as well? Awesome project can’t watch to get started and have my Samsung s4 dance around on the table. I started writing a reply here, but it got super long… So I turned it into a separate blog post! If you have further questions, we can start a discussion at that post. Hello again Cevinius. Well I´ve finished my MobBob. I am using an Arduino Nano and a HC06 Bt module. My bot is acting quite strange. The first 2 movements goes well. Although bot stays shaking (maybe it´s cold lol) and when I do some commands after 2 first (whatever I choose) the bot do crazy moves and shakes faster and roug (sizures?). So need to unplug power and turn it on again. I use baud rate 9600 for hc with Arduino Nano (other baud rate doesn´t work). No other mods on .ino file. Well, I did all I know (not much) and now I need som help! Changed RX and TX pins (11 and 12) to 6 and 7. More stable, but still moving crazy sometimes. HC06 module sometimes turns off, forcing system reset. How are you powering everything? From the behaviour that you describe, my guess is that the power source is not providing enough current. I’m guessing that when the servos do a “heavier” action, they are drawing most of the current, then the microcontroller and bluetooth module don’t have enough and sometimes reset or stop behaving. I’ve seen similar behaviour in some of my older bots when I was running them with NiMH AA/AAA batteries. Hi, I use a cell phone battery extender (5v ) but I didin´t payed attention to its max current output. I will see what´s happening and calculate min current needed. Thanx for your help! I´ll post the outcome later! Cool. Let me know how you go! I´ve finished my MobBob. I am using a Bluno beetle. I’m wondering what is the status about an OIS app? Sorry about the slow reply. I was busy moving house this past week. That’s great news about finishing the build!! The main hold up with iOS is the voice recognition. I have the vision part and the bluetooth part to control the robot working already. I may release a cut down version first and then update it later with the voice recognition. I’ll start doing some proper tests of the iOS version next weekend to get it ready for release. The cutdown version is great for testing the hardware. I can’t wait. Thanks a lot. Cool. I’ll keep you posted when it’s done! I’m currently building some MobBobs for a museum to use. I’ll get onto the iOS version once I finish building these guys. Any news on the iOS version? My son and I would love to build one, but don’t have an Android phone handy. I still haven’t had time to look at it since work has been crazy. However, this weekend is a 3-day weekend. I don’t think I’ll be able to get the voice recognition stuff working on iOS, but I’ll see if I can make the cut down version. I’ll post an update on Monday on where it’s at. Cevinius, now it´s working without movement artifacts. Just changed battery with 2 A output. But Companion mode doesn´t listen voice commands. Other functions working perfectly! Cool. That is great news about the movement!! With the voice commands, please check that your phone is set to English. Currently it will only work if the phone’s language is English. Also, do a test with another voice app to see if it works. For example, the voice search in Google Now. If it’s working there, then it should work in MobBob too. Great project! I’m living in France and my phone is set to French :-(. I can change it to English, but is not practical for many reasons. Have you considered sharing your app code so others can change voice commands and/or language? Has anyone tried this with a pro mini or pro micro with hc-05 /06? using a 5v 1A powerbank but cant even move one connected servo.. what am i doing wrong? Have you tried sending the commands over USB to determine if the problem is bluetooth related or general servo control related? Also, have you tried driving the servos separate using a basic servo test Arduino program? (E.g. the “Sweep” example that comes with Arduino.) That will help determine if it’s a software problem or a wiring problem. Is it allowed to ask you which Unity BLE plugin are you using in your apps or is it a secret?? Of course! 😀 Also, thank you for your helpful reply in the other thread!! Are you going to write a Unity app too?? If so, please let me know how you go. Fantastic, Maciej!! Sorry about the slow reply. I’ve been overseas on some business trips recently. I am working on a MobBob and was trying out the Voice Rec. One time I got it to work right, but every time since, when I press the start listening button, it beeps and says no match. I downloaded the latest version from the Play Store. I am running on a Nexus 5 using the Don’t Connect option (since I don’t have the body ready). Everything else seems to be working as far as I can tell. Maybe try restarting the phone, and also double check that you are online and connected to the internet. I occasionally find it gets into a state where it says “No Match”, but usually when I restart the app (kill it from the task-manager type thing and then restarting it), it usually fixes itself. Any plans to opensource the Android app? I would love to see this thing take off! The current version of the app uses some proprietary libraries (and also some stuff from my work), so I can’t share it out as is. However, I am interested in redoing it so that it can be shared out. I think having an open source code base for app-driven robots would fantastic! I would love to see other people make applications for this little robot! Let me know what is proprietary and needs to be left out. I am thinking of possibly running a grade school robotics club based off of this if we can put together an app that can be extended to support scratch or blocky. I like the voice recognition and open CV visual stuff you have integrated. I am not necessarily an Android app developer but I do know a bit about porting android to various embedded boards from an OS perspective from work experience. Also, I am working on some modified models to fit different phones and batteries using onshape. What did you use to design your models? I’m also thinking of rolling the designing of the custom phone holder into the curriculum. 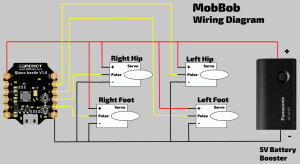 I heard of someone who successfully used MIT App Inventor to make their own app to drive MobBob. (They have videos of their work on YouTube.) So, that could be something the students could use potentially to make apps for MobBob. The commands that MobBob’s Arduino code uses are pretty simple, so it should not be too hard to write something that sends them via Scratch/Blocky. As a starting point, it might be easiest to skip bluetooth/Android and use a USB connection direct from the PC to the robot. I did this to make the code base cross-platform (most of the code already runs on iOS too), and also because I wanted to make use of other game-engine functionality for robotics (e.g. path finding, etc). It also makes it easier to do animations and emotes… I set things up so that I can do a lot of dynamic facial animations, but haven’t had time to make full use of that yet. Because it’s in Unity, the version of OpenCV I’m using is a special C# port. (The interface is based on the official Java bindings, but ported to C#.) It’s a library I purchased and cannot be distributed. On top of that, my code for the object recognition was initially written for my work, so I can’t pass that code out. The voice stuff I’m using is also a package that wraps the Android voice stuff for Unity. The wrapper for the package is not too complicated. The complexity is mostly in the parser that I wrote. It tries to understand what the user wants without the user needing to say exact commands/phrases. I’m actually planning to re-write the parser to make it more flexible so that users can add their own phrases, etc. With the 3D printed parts, I used Blender to make the models. I chose that initially because it was free, but have grown to like it. Prior to Blender I used a few things including 123D Design. I think it would a great idea to include designing parts in the curriculum. You could pass them a template file with the connector plates, and they could make the phone/battery holder around those. That would allow some flexibility in their design while ensuring that they will fit on. – Do you know if a 1A/2200mAh battery such as https://www.adafruit.com/product/1959 provides sufficient power output for the 9g servos? I’ve found these available on overstock sites for as ~$1 in bulk. That battery you reference doesn’t seem to be available anymore. That is amazing, fantastic and awesome to hear. I can’t wait to check it out!! 😀 Please keep me up to date with your progress. That Nano + HC05 combo sounds like a good deal, and seems like that price would be hard to beat. I haven’t seen anything cheaper myself. Maybe check if that HC05 is a 5V-TTL tolerant version? I’ve heard that some are… If it is, would save the extra board. All the best and stay in touch! Things are moving along well with my ‘BlocklyBot’ app. I will likely setup a website dedicated to the course I’m using it for but until then the course is detailed in the BlocklyBot wiki: http://github.com/tharvey/BlocklyBot/wiki. I’ve added Bluetooth support and have device support now for Bluno and HC-05. I’ve added a ‘speak’ block and am still working on some other functionality before I put the app into the Google’s App store. For my course, I’ll be having the students use Tinkercad but I chose OnShape because it was way more featured. Awesome! The new parts look good. I really like the course description and the build photos on the Wiki page. Can’t wait to see more, and to try the app out. Thanks for the update, Tim! I’m struggling to get the text to speech working. All the other sounds work fine. Which tts engine does the app use? I’ve been using the Google TTS engine and have been testing on Nexus devices. Thanks – checked Google TTS and discovered I didn’t have voices installed – all sorted out now. While assembling I was thinking it might be worth adding a couple of anchor holes on the feet for cable ties to hold the servos down. can we use arduino uno with hcsr05 btmodule instesd of bluno. There is a “Bluetooth” folder in the git repository with the Arduino code for this. Saludos..te felicito; muy buen proyecto, me gusta mucho la interacción..no has pensado en sacar a MobBob hablando en español? seria muy bueno para los que nos gusta estas cosas en latinoamerica… gracias por compartirlo. Hi, my friend, I would like to help translate the program into portuguese brazil. Could you share the code with me? How do I connect a raspberry pi with hm10 to a bluno nano? I’ve tried via serial over Bluetooth but it doesn’t work. I haven’t tried doing that myself, so I can’t offer any advice. All the best! I’m not able to share the project since it includes from 3rd party libraries, and also some code from my work. It makes use of the OpenCV library available from the Unity Asset store. It’s a nice package and I’ve had great results with it in this and other applications. I wish you all the best for your project! Wow, this is incredible! I was getting into 3D printing, heading towards doing a project very much like this. Except this would’ve taken me 5 years. 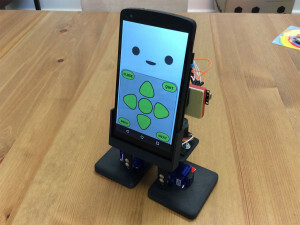 Harnessing the power of the phone and combining it with Arduino is brillant. And I was looking for a program that would be a robot with personality. I read somewhere here that you got very busy at work, which is why it is so quiet here. Any time frame on when you’ll be able to get back to this? would it take long to add some more speech to him? eg – How are you? Bigger request – you have him identifying your face. He tracks a ball. Is there any way he could track your face? That is, sitting on your dekstop, could he “watch” you? Again, trying to make him more autonomous, seem a bit more “real”. Last request – did I see a video with an ultrasonic sensor?!? Has that been added into the Arduino code? I would love that!! Otherwise, I’m looking also at Otto the biped – maybe you can adapt that code? He wanders around, beeps if he encounters and obstacle, and then turns. It makes him seem very much “alive”. Sadly, the feet servos look like they are mounted entirely differently, so the code would need to be interpolated. Thanks so much for what you’ve already done! Yes! You should be able to do that for sure. I use the battery extender for convenience (having the charging mechanism, etc), but you can definitely just build your own battery pack! You may want separate supplies for the microcontroller and servos, or build something that can ensure there’s enough current supplied to drive both the microcontroller and servos. I found that using a basic NiMh battery pack (e.g. 4 x AA) sometimes didn’t supply enough current (when the servos were moving). It would lead to the microcontroller going into a weird state, where the servos would then move randomly. Hmm … the link to the app in google play seems to be broken? Hi, we want to translate your program to Russian. How to contact with author to discuss detailes? the link to the app in google play seems to be missing. As mention by others, the app in google play seems to be missing now. Is there any chance it will be back? Or could it be that it is acceptable elsewhere? Muchas gracias por este magnífico trabajo Adquirí un bluno ya que no conseguía comunicar BT Arduino. Espero que funcione. Mañana probaré . Enhorabuena por tu proyecto!! !